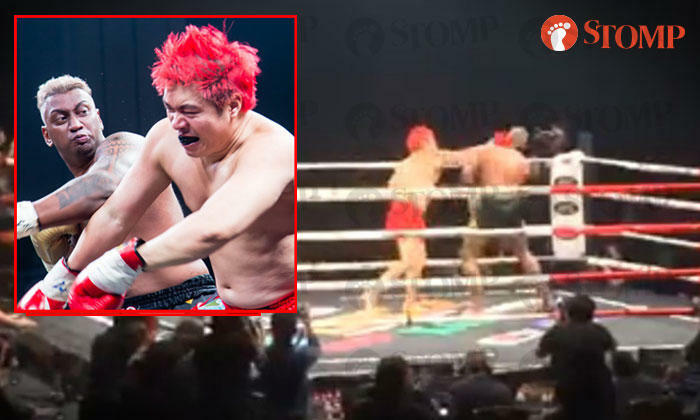 Pradip Subramanian, who faced Steven Lim in a Muay Thai match at the Asia Fighting Championship (AFC) yesterday (Sep 23), has died following the conclusion of the bout. In a Facebook post, 41-year-old Lim, a YouTube personality who competed in singing contest Singapore Idol back in 2004, expressed his condolences for his opponent. Read the post: "Rest in peace, my really truly respected fearless warrior and fighter and awesome boxing instructor, Pradip Subramanian!!! This is a very sad moment for me to learn about the shocking news! "You taught us all the virtues of being fearless and strong and the importance of keeping an active and fit lifestyle! My deepest condolences to you. You are truly our hero." When contacted, Lim told Stomp that he was 'shocked and very sad' over the developments. Subramanian's family also took to social media to announce his passing. "Our beloved son passed away suddenly. It is too late to put it in the newspaper," read a caption that was published along with a photo of the veteran bodybuilder on Facebook. His wake will be held at Woodlands Street 81, Block 807, on Sunday. Subramanian, the president of the World Bodybuilding and Physique Sports Federation (WBPF), was a last-minute replacement fighter for Sylvester Sim after the latter pulled out due to complications with insurance. This is the first time Subramanian, 32, has competed in a Muay Thai fight. During the scheduled bout, he received blows to the head on several occasions. After the fight ended, he appeared to be in a daze and sat by the side of the ring for a few minutes. He was then sent to Singapore General Hospital, where he died. Bryan Tee, a 19-year-old Muay Thai fighter who also competed in yesterday's AFC held at Marina Bay Sands, said that Subramanian may not have had proper training for his fight. "He wasn't supposed to be fighting, he's a bodybuilder, so he might not be that well-conditioned for this fight. Because a bodybuilder might not work much on their cardio but we do a lot of cardio workouts," he told The Straits Times. The AFC has released a statement with regard to the events that have unfolded. "We are deeply saddened to share the news that Mr Pradip Subramanian, Exhibition Match-Up fighter and President of the World Bodybuilding and Physique Sports Federation of Singapore (WBPF) has passed away at the Singapore General Hospital (SGH) on 23rd September 2017 at 21:00 hrs. "We are in close contact with the medical staff at the hospital to ascertain the cause of death and request that during this difficult time we should come together and extend our support to Mr Subramanian's family, friends and associates and refrain from any speculation. "An official press conference/statement will be held in due course. "Mr Subramanian's project, the AFC Physique Championships (APC), which is scheduled for 24th September 2017, will be cancelled as a mark of respect." A Facebook video posted by audience member Nigel Chua shows Lim and Subramanian exchanging blows towards the end of the match. Lim is subsequently announced as the winner and received his championship belt. Meanwhile, Subramanian can be seen trying to catch his breath and while leaning against the ring ropes.